I bought a Trezor, installed everything, and sent some BTC to my wallet. Everything was working correctly. Then today, after not using the Trezor for a few days, I tried to connect and am unable to. 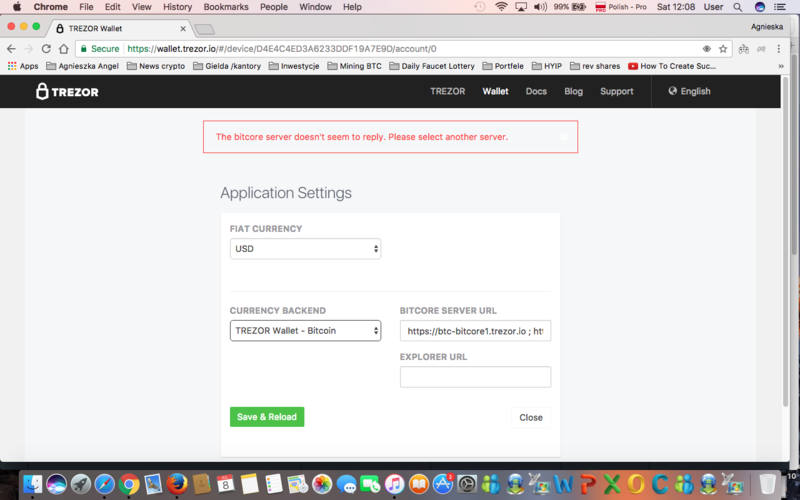 After connecting the Trezor and putting the password in, I have a constant error message that says the bitcore server does not seem to reply, please select another server (as in screenshot). What does it mean and what should I do to connect to my wallet? It is the first time something like this has happened. If your Trezor can't connect to Trezor's servers, then it won't be able to make transaction (as it'll be unable to find older transactions, unspent outputs). Try the other servers. If it still doesn't work, contact Trezor support. change currency backend to block explorer may fix the problem, I tried and it fixed. Not the answer you're looking for? Browse other questions tagged bitcore trezor or ask your own question. How does a Trezor passphrase prevent restoration of a wallet if an attacker knows the seed? If I lose a Trezor then how does the replacement get access to the same wallet? How does Trezor's wallet recovery work if the private key never leaves the device? Can I run Trezor Wallet against my own local node on OSX? How long does a payment take to appear in my wallet, If not how do I reacieave it? How to install Trezor Bridge?